Jade Resilience: What Have You Maintained for At Least Ten Years? "What have you maintained in your life for at least ten years?" "What if all you've maintained is a good pair of shoes?" We laughed, but hey. That tells you where a person is at in life, doesn't it? And then I turned the question on myself. The answer varies year to year, of course; I finally had to stop reviving my banyan tree which I'd grown from seed. I killed it three times; no, four. In another episode of prolonged distraction, the jade tree I brought to the office rotted down the middle. I've not had this plant for ten years; more like five. I negotiated it in with a rug purchase when I was still trying to keep a decent house with the Pakistani. For the record, I also still have the rug. Jade was a mere four inches tall when I first brought her home, and she flourished in the bright kitchen window. When I moved to Annandale, I brought Jade to my office so she could enjoy a southern light exposure like in the DC apartment. Still, there isn't the same amount of light, and I forgot to pay attention this fall during our crazy-busy season. Once the work flow slowed down, I saw the damage. 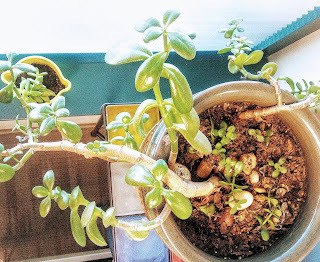 Jade is a resilient succulent; I've stuck all the green stalks into the earth in the pot. These babies will grow as healthy as they can be in this environment and may react negatively next time I have to move the whole plant. But they will be resilient here. Be Where You Are. If some of what you've been tending can no longer be supported, let it go naturally. Give room to what is able to flourish in you now, where you are. Literally and metaphysically. Stretch those wangs. In the picture, you can see a glass-tiled table on which the pot sits. That I have been carrying around since 2001 - traded with my friend Suzanne for a set of nesting tables that would fit her new place. There have been times I almost gave up the table, but I've kept it as a testament to my quasi-stability. When I'm ready, I'll let that go, too. Peoples and persons, if you are confused about the concept of partnering, wondering what went wrong in your past, or questioning whether you can ever get this right, please read the testimony of Roab Copeman, who is doing the thing. You do not have to relegate yourself to what you were given in life. You can forge a path. You deserve everything you can discern. Jade plants always flash me back to my stint at NMSU in Kirksville, Missouri and my friend Marcella, who had an impossibly old, big, and healthy jade plant. Marcella was a townie, meaning she was an actual born-and-raised citizen of Kirksville and not a temporary one like the college students. She had a job in a local factory that, with the college, comprised most of the non-agrarian economy of the town. She always wore Ciara, which you are probably too young to remember, but was popular in 1973. Her apartment was an achingly perfect reflection of early-20-something female independence and architectural efficiency: a little space carved out of an old building in downtown K-Patch. Her place somehow achieved, with complete insouciance, a 70s-decorating-for-the-liberated-woman vibe ("How to Make the Most of Your Darling Little Cosmo-Girl Pied-a-Terre"). It had a Murphy bed that, when opened, reached from wall to wall, and a living room awash in an enviable amount of natural light. The jade plant luxuriated in that light, which somehow seemed to be exactly what it wanted, because some of its leaves were at three-plus inches long and it was more like a small tree than a house plant. Thanks for making me remember those days. They are a truly treasured part of my landscape. <3 I love it when my story spawns a story! I've walked out on my life with nothing twice, and formed a new one. Each time it was the right thing to do.